This year, I had big plans to be Madonna, circa Confessions. This costume was dependent on finding a fuschia three-quarter sleeved leotard... which is apparently impossible to find. Seriously. I looked EVERYWHERE! So, this idea was put back on the shelf at the last minute. By the way, if anyone knows where to find above-mentioned leotard, please let me know; I'm still very attached to the idea. My fall back plan came to me on Friday night when I found a shoddy Miami Ink costume at Target, and, voila! Kat Von D! The makeup was based on her usual look of dramatic dark brown eyes with flicked out liner, and her signature red-orange lip. er the brow and in the inner third of lid. A thick swipe of black liner, flicked out at the end and a coat of Diorshow mascara completed the eyes. For the lips, I used Kat's own lipstick in Stiletto (sold at Sephora stores nationwide). 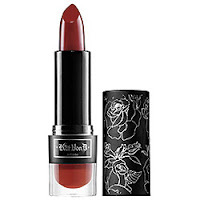 I LOVE this lipcolor - it's a very warm orange-based red that is super bright. To ensure the color lasted all night, I first lined all over the lips with a red liner and then applied two coats of Stiletto, blotting in between applications. I used a warm blush to contour the cheek bones, and finished by drawing on her tattoos: blue stars around the left temple and a little lightning bolt under the right eye. And, done! Ready to party!